It’s obviously good citizen behaviour to report something that needs fixing to your council, whether it’s a pothole that could cause an accident, or a broken streetlight that has plunged the area into darkness. 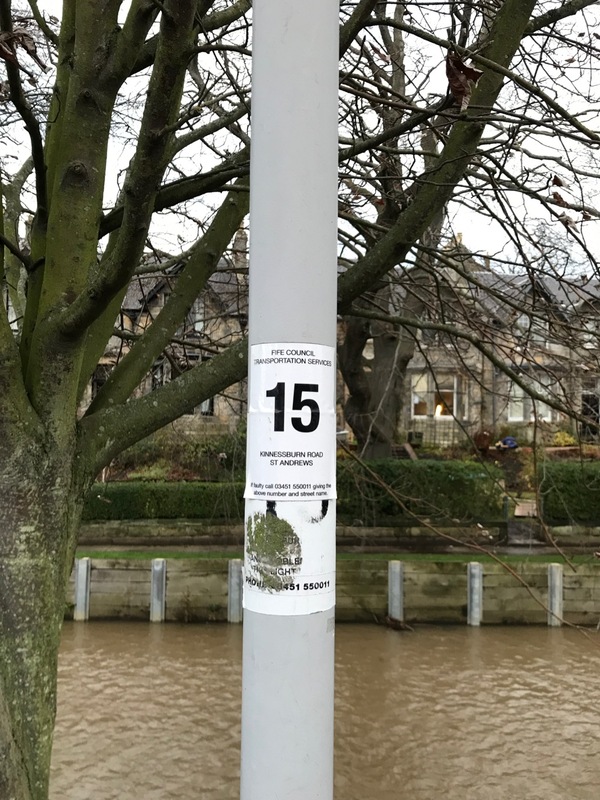 But there’s one type of report that isn’t very useful to councils, and in fact brings unnecessary costs and inconvenience: when you tell the council about an issue that’s already been flagged up by someone else. 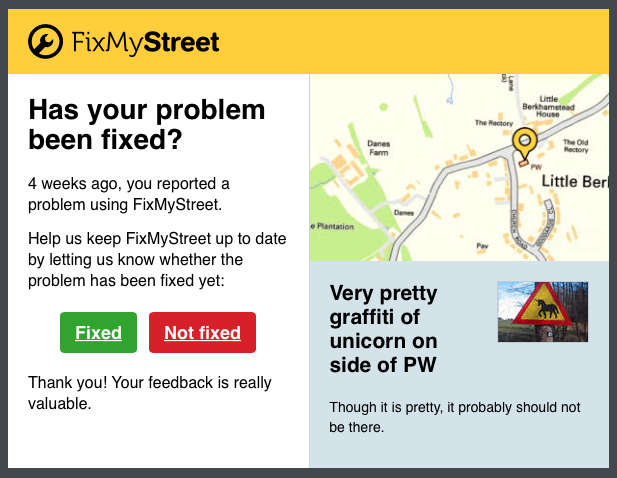 FixMyStreet has always been helpful in this regard. 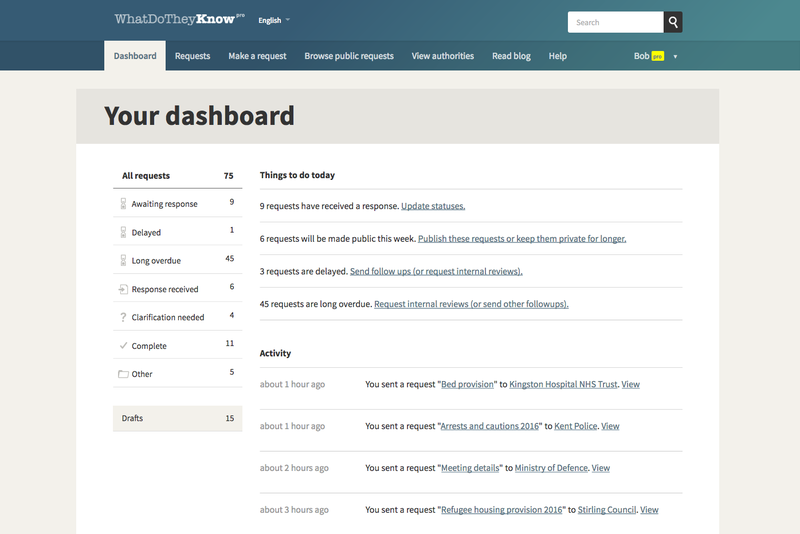 It was groundbreaking in displaying all reports in public, unlike most council systems when we were first developing it. 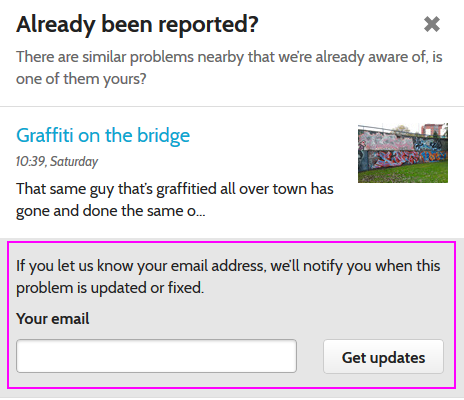 A user who goes to make a report can see right away if there’s already a pin in that spot, and check whether the existing issue is the same one they were going to add. 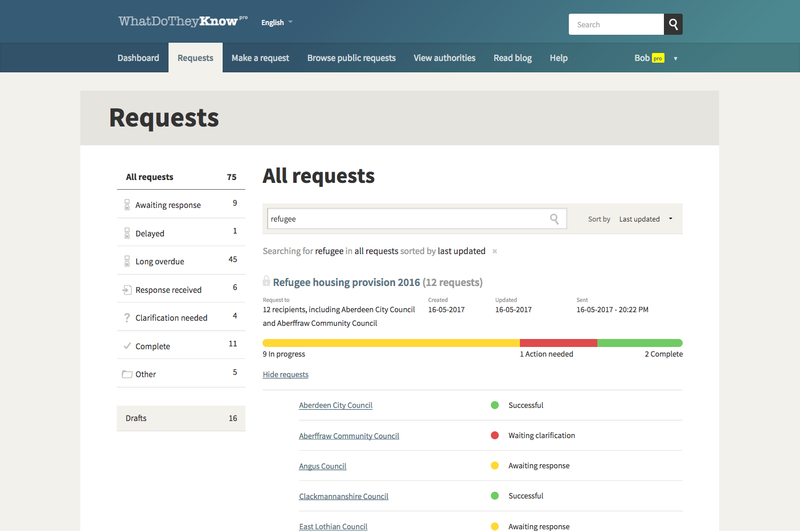 Now we’ve taken that concept a step further in some work which we’re trialling on Bath & NE Somerset’s implementation of FixMyStreet Pro. 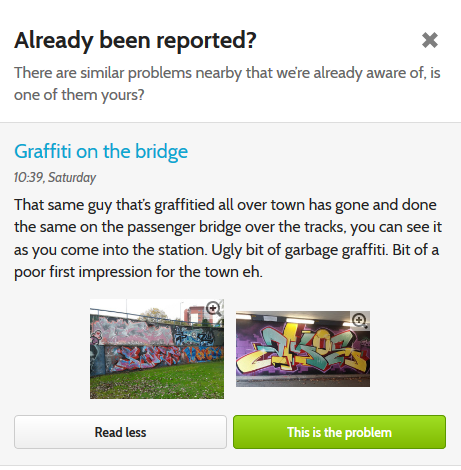 Bath & NE Somerset will run this feature as a trial over the next month; then once they’ve got feedback from their users, we’ll hopefully offer it to every other council on the Avenue tier of FixMyStreet Pro. 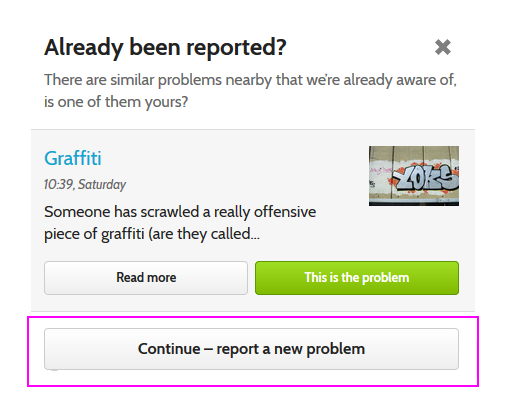 If you come across this feature while making a report in Bath or environs, do let us know how it works for you. 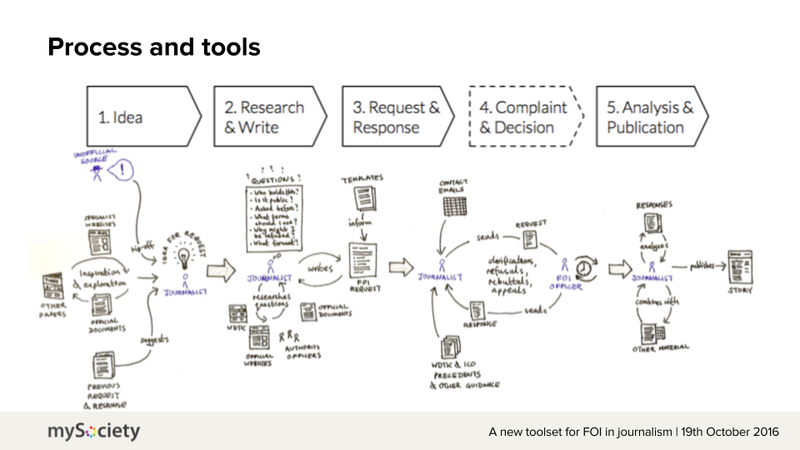 If you’ve been watching the progress of our Freedom of Information toolkit for journalists, campaigners and activists, you might be interested to know that we are now accepting applications for pre-launch access. Successful applicants will have an early opportunity to put the service through its paces. WhatDoTheyKnowPro will launch as a paid-for service, but as a beta tester you’ll have up to a year’s access for free, because we’re keen to see how you’ll use it — and to hear your feedback on which features are useful. 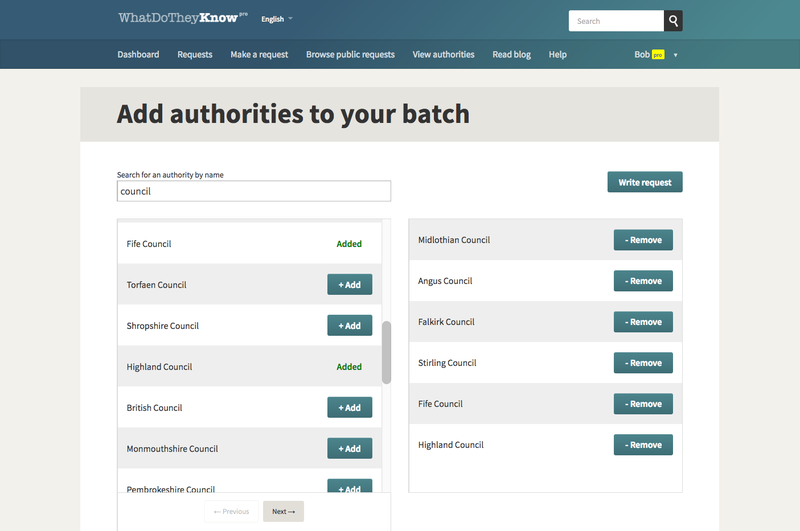 WhatDoTheyKnowPro is our first launch of Alaveteli Professional, accessed via the WhatDoTheyKnow website and specifically for UK users who utilise FOI in their work or campaigning. It’s the first instance of the service we plan to make available to other Freedom of Information sites running around the world on our Alaveteli platform. Since we last caught up with Alaveteli Professional, we’ve made really concrete progress with several of the features that, at the time of that blog post, were just entries on our long to-do list. We’re excited about the batch feature in particular, and we know that many of our prospective users are, too. At the same time, we’ve heard some concerns that it might encourage a scattergun approach that wastes authorities’ time. Our planned development will ensure that people use this feature responsibly, and, consequently, get the best returns from it. This will include a prompt to send a smaller batch initially, so that the remainder of the requests can be refined based on the quality of information that is returned — there’s nothing worse that asking every council in the country for information and then realising that you’ve worded your question in a way that means you can’t use the resulting data! 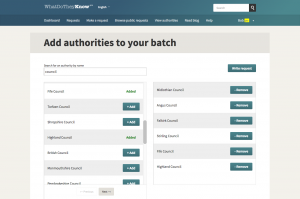 At the moment, batch requests can’t be made on WhatDoTheyKnow without help from the site administrators. We’re aware that many journalists and activists already make many batch requests outside WhatDoTheyKnow for this very reason. 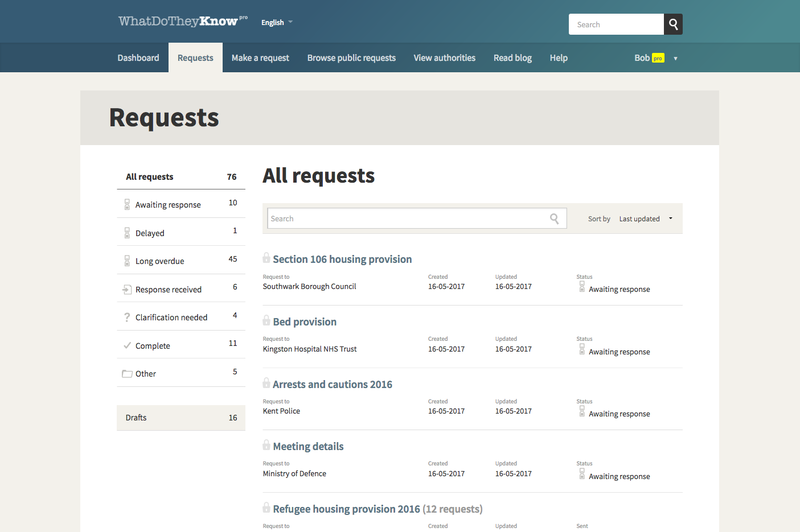 We’d like more of these requests to be released in public (we estimate that around 15% of UK FOI requests are made via our site): so by including this capability in WhatDoTheyKnowPro, we hope we’ll not only be steering people to use those powers sensibly, but that much more information will also end up in the public domain — maximising its usefulness. If that all sounds exciting, then apply here. 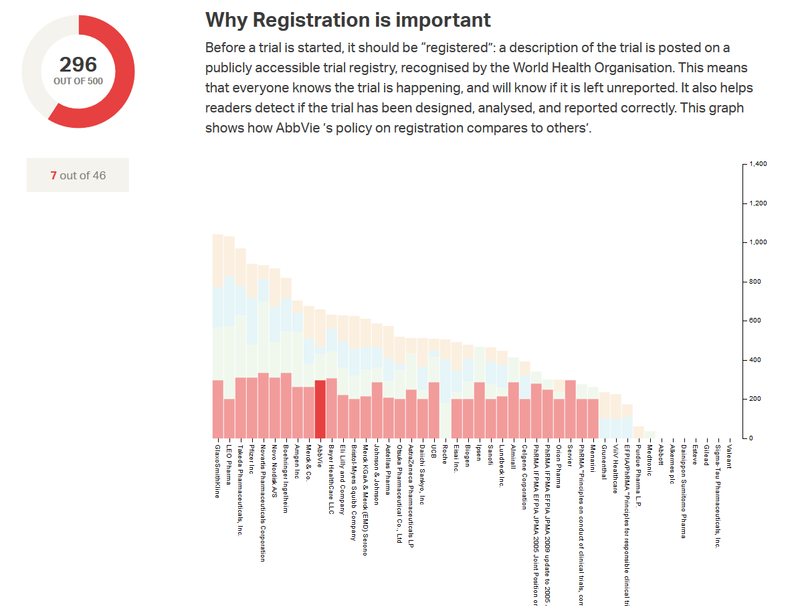 We’d love to hear how you plan to use WhatDoTheyKnowPro. 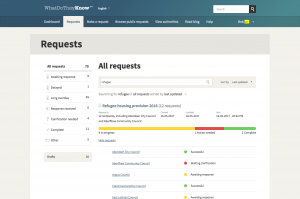 The FixMyStreet codebase is used all over the world by people running versions of the site for their own country or jurisdiction. 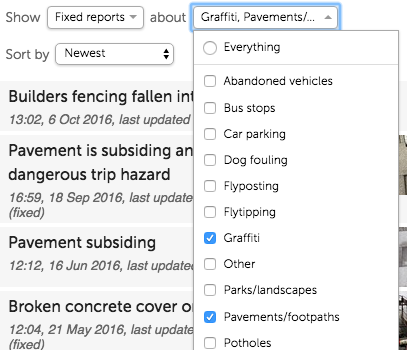 This week, we’re proud to announce the release of FixMyStreet version 2.0. 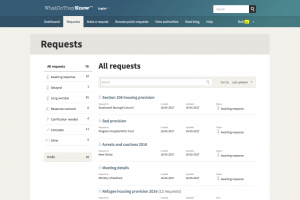 This version contains a wide array of new features that benefit FixMyStreet sites’ users, administrators, and the officials who receive reports. 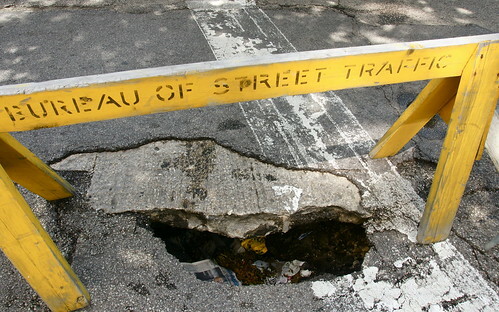 They include elements that the UK FixMyStreet was the first to trial, such as nicer-looking HTML emails for users and authorities, the ability to filter reports by multiple states and categories, a new admin user system with graduated permissions, and various bugfixes and development improvements. 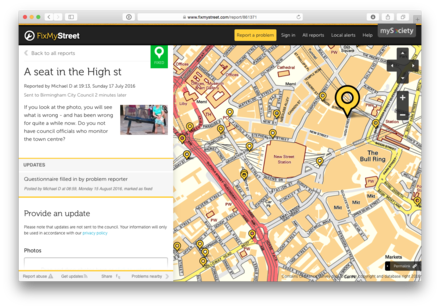 Over the next few weeks, we’ll be publishing a series of blog posts over on fixmystreet.org/blog/, examining the changes in detail. 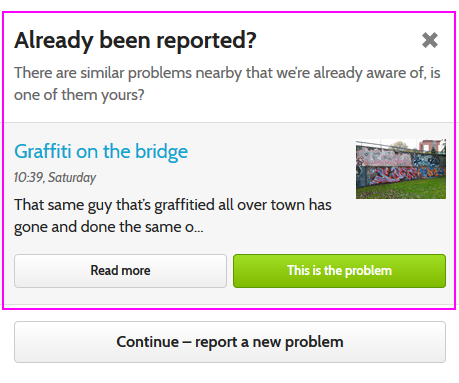 If you run a FixMyStreet site, or you’re just interested in coding and technical issues, you may find them of interest. Meanwhile, here’s the broad overview. Admin users can now use the same log-in right across the site – whether they’re making a report like a standard user, or logging in to make edits and moderate the site. Bugfixes include updating the top-level domain (TLD) list for email validation, hiding authorities which don’t exist any more on the all reports page, and fixing the previously-broken photo preview display after form submission. We have dropped support for Internet Explorer 6. If you’re a re-user of the codebase, there are a number of changes that will hopefully help you out. 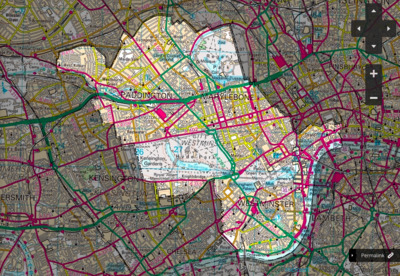 See the extended version of this blog post on fixmystreet.org for more details. Suppose we sent an automated tweet every time someone made a successful Freedom of Information request on WhatDotheyKnow — would it bring more visitors to the site? And, if you get a response to your first FOI request, does it mean you are more likely to make a second one? These, and many more, are the kind of questions that emerge as we refine the advice that we’re offering partner organisations. Our Freedom of Information platform Alaveteli underpins Freedom of Information sites all around the world. When we first launched it, our only priorities were to make the code work, and to make that code as easy as possible to implement. But, as a community emerged around Alaveteli, we realised that we’d all be better off if we shared advice, successes and ideas. And that’s where we began to encounter questions. Some of them, like how to get more users, or how to understand where users come from, are common to anyone running a website. Others are unique to our partner structure, in which effectively anyone in any part of the world may pick up the Alaveteli code and start their own site. In theory, we might know very little more than that a site is running, although we’ll always try to make contact and let the implementers know what help we can offer them. There were so many questions that we soon saw the need to keep them all in one place. At mySociety, we’re accustomed to using Github for anything resembling a to-do list (as well as for its primary purposes; Github was designed to store code, allow multiple people to work on that code, and to suggest or review issues with it), and so we created a slightly unusual repo, Alaveteli-experiments. This approach also gives us the benefit of transparency. Anyone can visit that repo and see what questions we are asking, how we intend to find the answers, and the results as they come in. What’s more, anyone who has (or opens) a Github account will also be able to add their own comments. Have a browse and you’ll come across experiments like this one and this one, which attempt to answer the questions with which we opened this post. Some of the experiments, like this one to analyse whether people click the ‘similar requests’ links in the sidebar, we’re running on our own site, WhatDoTheyKnow. Others, such as this one about the successful requests listed on every Alaveteli site’s homepage, are being conducted on our partners’ sites. Our aims are to find out more about how to bring more users to all Alaveteli sites, how to encourage browsing visitors to become people who make requests, and how to turn one-off requesters into people who come back and make another — and then pass all that on to our partners. We hope you’ll find plenty of interest on there. We reckon it’s all relevant, especially to anyone running an FOI website, but in many cases to anyone wondering how best to improve a site’s effectiveness. And we’re very happy to hear your ideas, too: if we’ve missed some obvious experiment, or you’ve thought of something that would be really interesting to know through the application of this kind of research, you’re welcome to let us know. You can open your own ticket on the repo, suggest it in the Alaveteli community mailing list, or email Alaveteli Partnerships Manager Gemma. We’ve released Alaveteli 0.25! Here are some of the highlights. 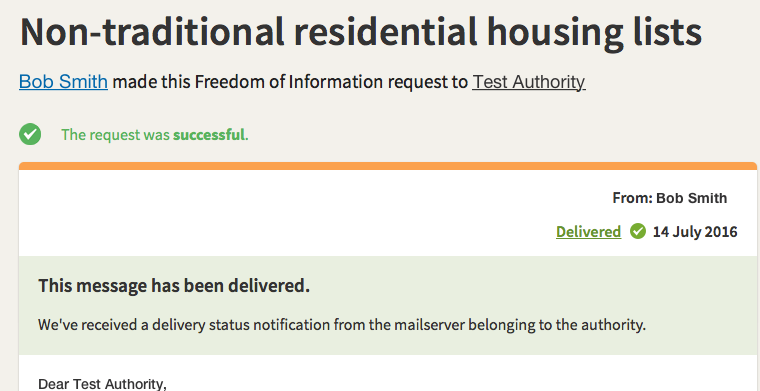 Gareth and Zarino have added a delivery status feature that shows whether a message has been received by the authority’s mailserver. This should provide reassurance for site users that messages are getting through and makes it difficult for an authority to successfully claim that they didn’t receive the request. Clicking on the delivery status indicator reveals a bit more detail about the status itself. Admins are shown more detail here including relevant mail logs to diagnose problems or provide proof to the authority if required. We’ve upgraded from the so-called “Legacy” (ga.js) version of Google Analytics to Universal Analytics. For most Google Analytics users there’s nothing to do here except sit back and enjoy continued technical support and new feature rollouts from Google but if your Alaveteli theme has custom analytics scripting, you should check Google’s upgrade guide as well as our upgrade notes to see if you need to make changes. If you’re not ready to move to this release yet, don’t panic – you may not get any shiny new features from Google but they haven’t published an end date for support yet. In addition to spam email, there’s been an increase in the number of accounts that create profiles containing spam links – presumably to boost their search engine ranking score rather than to trick people into clicking through from the site. 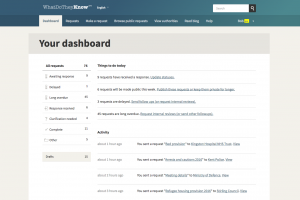 Having spent some time going through accounts on WhatDoTheyKnow to look for patterns, we’ve added some tools to this release to try to discourage this use of Alaveteli and to make it easier for admins to discover and ban offending user accounts. Martin has been working away on improving page load times and accessibility compliance to make the pages faster to load and easier to navigate. (A process we’re continuing into the next release.) We’ve also updated the help template code so that the examples are in the example theme rather than the core code and added a rake task to help check whether your theme implements the help pages correctly.